Congratulations! You have in your hand the park permit! The permit process with the City of San Diego has certain guidelines you must meet and prepare for. Click on the “Booking the Park” link to learn more. 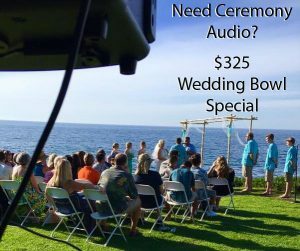 Our wedding Bowl Package includes ceremony and our park audio support FOUND HERE. Our Park Audio System for those that already have their Minister/Officiant/Celebrant and just need a powerful inexpensive sound system that meets the Park Permit requirements FOUND HERE.